One of the first vegan restaurants that I ever visited in Hong Kong, Loving Hut no doubt remains as one of my favorite places to eat. Reminiscent of traditional Chinese fast food eateries such as Café de Coral and Tsui Wah, they sell everything from meatless Shao Mai to vegan fried eggs. Each time I visit this place, I struggle to decide between the hundreds of dishes that all sound equally appealing, and the result is more frequent visits to ensure that I get a taste of everything that is available. FOOD: To my knowledge, Loving Hut is the only restaurant in Hong Kong that sells vegan fried egg (as pictured on the right) and vegan egg tarts (pictured below)! Their restaurant aims to provide a traditional Chinese dining experience without having to compromise the lives of animals or the health of our environment, and they certainly do an excellent job at it! Barbecue pork buns, dumplings, pizza, fried beef noodles, Happy Cow ice cream...you name it, they have it! 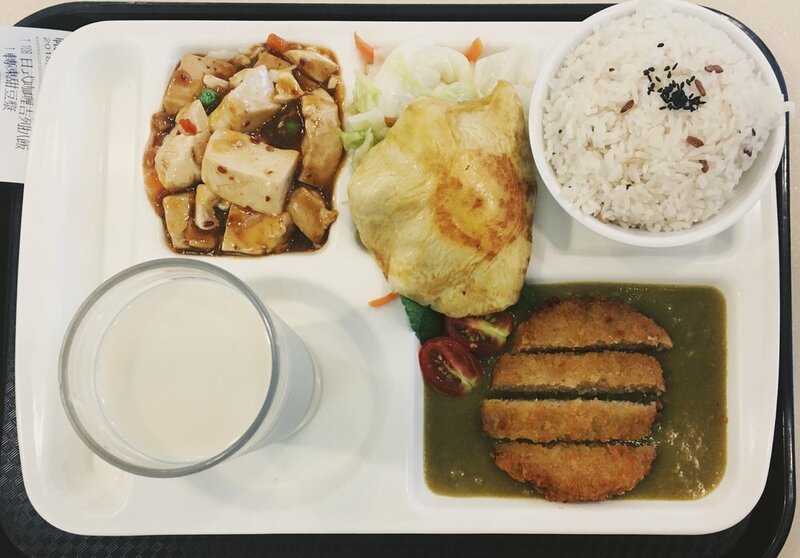 Every day, they offer a different lunch set and dinner set, and each set meal comes with rice, a soup/drink (hot or cold soybean milk), and three toppings of your choice. Some of the best toppings I've had with my set meals are the spicy shredded potatoes, sweet and sour tofu, the vegan steak, and of course, the vegan fried egg - which costs an extra $15 HKD. - The Iconic Vegan Egg Tarts: I cannot stress how important it is that you give these a try - they aren't as sweet as regular egg tarts, but the contrast between the texture and flavour of the filling at the crust makes a perfect combination, and it is a magical treat that can be enjoyed by all. - The Curry 'Pork' Cutlet: This vegan 'pork' is slightly softer than usual cutlet, but the flavour is all there, and the curry goes perfectly with the rice and everything else that comes with the meal (sometimes it comes as a surprise)! - The Tom Yum Noodles: Truly Yum-my. This dish was recently added to the menu, and I am so glad they decided to include it. Although it's relatively carb-heavy, it contains many faux meats such as vegan 'shrimp', and it's great if you want something spicy! PRICE: The reason why this restaurant ranks so high up on my list of favorites is not only because is their food delicious, but also because it is relatively affordable. Hong Kong's vegan eateries are known to be notoriously expensive, however, Loving Hut is defies this standard by setting its set meals at the modest price of $58 and its other dishes at no higher than $70 HKD. With a bit of everything included on your dish, these costs cover a very satisfactory meal that is both filling and enjoyable. Loving Hut is conveniently located 5 minutes away from Wanchai's exit A3. Simply walk out of the exit, cross the road, then turn left and keep walking until you reach the building that is home to Loving Hut! Of all the vegan restaurants I have visited in Hong Kong, Loving Hut boasts the most peaceful and homey environment of all. Every weekend at varying times, there will be guest performers coming in to sing, play an instrument, or educate. Most of the time, this will simply be accompanying background music to the conversations of guests. With the Free Wi-fi offered at the restaurant, Loving Hut also makes a wonderful place for gatherings, meetings, or anything along the lines of interacting with other people. Plastered around the walls are posters of celebrities who are also vegan and quotes from people who encourage the lifestyle. It may be troubling that most of the workers don't speak much English, but overall, it's a very supportive community and everyone is welcomed! In terms of the restaurant's behaviour towards environmental issues, they do a good job at reusing cutlerly, plates, and other items used to serve food, but they could definitely do with less plastic straws.